Almond Chocolate Chip Cookies – Everyone who tastes these cookies loves them! 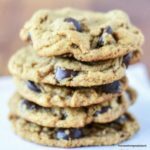 The perfect guilt-free soft chewy chocolate chip cookies that are gluten free and vegan and simple to make. We use cacao nibs made from raw cacao in this recipe, considered to be a superfood, and high in magnesium, they are filled with feel good nutrients, boost your energy and act as an aphrodisiac. Adapted from; The Whole Pantry App – almond meal or almond flour, melted coconut oil, pure maple syrup, cacao nibs (or dark chocolate chips), vanilla extract, Himalayan salt or sea salt, Baking Powder, Preheat oven to 170°C/ 350°F; Mix together all the dry ingredients except the chocolate nibs, and then add all the wet ingredients. ; Add the chocolate nibs to the mix; Line a baking sheet with parchment paper or a silicone mat. Take 1 tbsp of the mixture, roll out, and press lightly in the centre to give a thick cookie; Bake for approximately 10 minutes, until golden. Allow to cool on the baking sheet for 10 minutes. They will be soft when removed from the oven but will firm up when cooled. The centre will stay soft and fudgey when cool. ; If you prefer a crunchy biscuit, place the cookies back in the oven for 3 to 5 minutes. ; You can store in a sealed container for up to 5 days. ; – To make into double choc- chip cookies add 1 tbs of cacao powder.You can also freeze the cookie dough to make cookie dough icecream! Mix together all the dry ingredients except the chocolate nibs, and then add all the wet ingredients. Bake for approximately 10 minutes, until golden. Allow to cool on the baking sheet for 10 minutes. They will be soft when removed from the oven but will firm up when cooled. The centre will stay soft and fudgey when cool. If you prefer a crunchy biscuit, place the cookies back in the oven for 3 to 5 minutes. You can store in a sealed container for up to 5 days. To make into double choc- chip cookies add 1 tbs of cacao powder.You can also freeze the cookie dough to make cookie dough icecream!